Personalities among the DUP’s top posts will change but the focus will not, Gregory Campbell has said. Last week, Arlene Foster was confirmed as the replacement for party leader Peter Robinson who will stand down in January. Mr Campbell added: “The media has been absorbed with personalities in recently weeks at a senior level within the DUP. Given the past 44 years of our party and the seamless nature of a very small number of senior positions, that is understandable. However, it is at a time like this when clarity has to be given so that there is no room for ambiguity regarding the party’s direction both now and in the future. “The DUP was formed to ensure Northern Ireland’s survival in the face of the most bloody onslaught since our country’s inception. 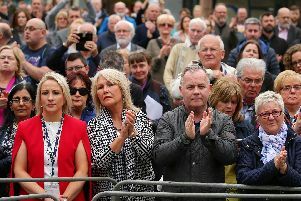 Violent republicanism and those engaged in that approach took a long time to realise they weren’t going to win, when that happened we had a responsibility to ensure that preparations were put in place to take the entire community forward into a future which would be better for everyone.